The Revolution LiftTM is an ADA-compliant aquatic lift that has been designed to support a 500-pound weight capacity. It can be anchored anywhere from 10 to 40 inches away from the pool or spa edge, so extra-wide gutters and raised decks are not an issue. The lift also featured a fully powered 360-degree rotation in either direction and has the ability to service two bodies of water in close proximity to each other. Many options are available. The Landeez all-terrain wheelchair allows patrons to enjoy the health benefits of a variety of outdoor activities. It is great for trips to the beach, strolls in the forest and for accessing unpaved areas. The Landeez rolls over sand, snow, gravel and soft soils with remarkable ease. Finally, patrons can enjoy total access with family and friends. For patrons who want to work out without the heavy pounding on joints, aquatic exercise is a perfect fit. The Aquatic Treadmill/Cycle, Model 602, combines a full-size treadmill with a cycling-type exercise machine. The water naturally provides variable resistance. Featuring solid construction for daily use. With the ADA working toward making pool lifts mandatory for public pools, you may want to consider an alternative to the typical corded headset. 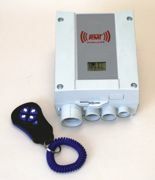 RehaMed International has introduced a waterproof wireless alternative to facilitate pool lift operation. It fits new lift systems and can be retrofitted to existing lifts. In busy locations, it can be issued only to people who will use the lift, avoiding unnecessary use or potential damage. It is packaged with a lanyard so the user always has control of the lift, preventing the circumstance when another user leaves the wired headset where it cannot be accessed. Aquatic Access Inc. manufactures water-powered lifts providing access to pools, spas, boats and docks for individuals who have difficulty with stairs or ladders. Several models are user-operable and meet the Americans with Disabilities Act guidelines for access to public pools. With over 20 years of lift-building experience and more than 12 models, Aquatic Access has an international reputation for safety and reliability, as well as for ease of use and simplicity of design. For these reasons, Extreme Makeover: Home Edition chooses Aquatic Access when a makeover requires access to a pool or spa. Bankshot Sports are inclusionary family sports: Bankshot Basketball, Bankshot Tennis, Bankshot Tri-Sport and Bankshot Soccer. These are non-aggressive sports where players play alongside, not against, each other. Bankshot Sports are non-running, non-jumping companionable sports, fully ADA- and IDEA-compliant. Bankshot Sports are Total-Mix Sports based on Universal Design that offer integration, socialization and inclusion of the differently-abled in the world of sports. The VitaGlide exercise system provides a safe and effective workout for people with disabilities or other deconditioning issues. Using its unique V-shaped linear tracking, the VitaGlide workout focuses on three different areas. The pushing and pulling motion strengthens both sides of the shoulders to balance the joint and prevent injury and pain. The trunk rotation that results from the "V" design works the stomach muscles. The resistance control provides a great cardio workout. The VitaGlide Pro is designed for commercial applications, such as rehabilitation centers, gyms, health clubs or wellness centers. Lincoln Aquatics offers the Portable Aquatic Lift (PAL), which requires no mounting to the pool deck. The PAL Lift is powered by a 24-volt rechargeable battery. Handheld automatic controls provide convenient control for all users. The lift has a lifting capacity of 300 pounds, yet can be easily maneuvered to any location. The PAL is easy to use and is a perfect fit for facilities requiring accessibility to more than one location. The unit can be left in place or stored away when it is not needed.